February 2011 – Fight Aging! Great inroads have been made in recent years into an understanding of the accelerated aging condition called Hutchinson-Gilford progeria syndrome, or progeria. Despite its extreme rarity - there are less than a hundred sufferers known worldwide - the condition is of great interest to aging researchers, and this is because of what progeria might teach us about a range of important cellular mechanisms and their impact on "normal" aging. The breakthrough discovery linking progeria with malformed lamin A protein back in 2003 came about as a result of advances in biotechnology. Thanks to rapid technological progress, the means to make this discovery became cheap enough that one determined researcher could push through to succeed in a comparatively short time frame. Ten years previously, that would have been impossible for such a small research effort. "There is also evidence that defective lamin A accumulates during the normal aging process via the sporadic use of the alternative splice [site]. Therefore we are very keen [to] identify new aging markers and explore other aspects of human premature and physiological aging." "The reprogramming process erased all nuclear and epigenetic defects and the rejuvenated pluripotent cells looked and acted like perfectly normal healthy cells." Which is a very interesting result. You might compare it with another demonstration made recently in which damaged cells lost their damaged status when altered to become induced pluripotent stem cells. Unlike that case, however, here the induced pluripotent cells still bear the seeds of the damage: when they differentiate into other types of cell, those cells once again produce the bad lamin A and suffer the characteristic effects of progeria. Genetically modifying progeria-derived iPS cells to shut down the expression of progerin staved off the premature appearance of aging phenotypes after differentiation. "Transplantation of the progenitor cells derived from the 'corrected' progeria iPS cells might hold the promise to treat these progeria children in the future." As I have noted in the past, a comprehensive fix for progeria may well be of some benefit to those of us suffering "normal" aging as well. Can improving the technologies of vaccination lead to gains in the capacity of the age-damaged immune system? Progress in the ability to manipulate the immune system may pay off in unexpected ways when further technologies are built atop a new platform: "Vaccine scientists say their 'Holy Grail' is to stimulate immunity that lasts for a lifetime. Live viral vaccines such as the smallpox or yellow fever vaccines provide immune protection that lasts several decades, but despite their success, scientists have remained in the dark as to how they induce such long lasting immunity. Scientists [have] designed tiny nanoparticles that resemble viruses in size and immunological composition and that induce lifelong immunity in mice. They designed the particles to mimic the immune‑stimulating effects of one of the most successful vaccines ever developed - the yellow fever vaccine. The particles, made of biodegradable polymers, have components that activate two different parts of the innate immune system and can be used interchangeably with material from many different bacteria or viruses. ... the yellow fever vaccine stimulated multiple Toll‑like receptors (TLRs) in the innate immune system. TLRs [are] molecules expressed by cells that can sense bits of viruses, bacteria and parasites ... the immune system sensed the yellow fever vaccine via multiple TLRs, and that this was required for the immunity induced by the vaccine. ... We found that to get the best immune response, you need to hit more than one kind of Toll‑like receptor. Our aim was to create a synthetic particle that accomplishes this task. ... In experiments with monkeys, nanoparticles with viral protein could induce robust responses greater than five times the response induced by a dose of the same viral protein given by itself, without the nanoparticles." Young mammals are capable of feats of regeneration: even in humans, it has been known for young children to regenerate lost fingertips. That capacity fades with age, however. Researchers are investigating the biochemistry of this behavior for much the same reasons as they look at regenerating species such as salamanders - if the capacity is there, perhaps it can be restored in adults. "Researchers, working with mice, found that a portion of the heart removed during the first week after birth grew back wholly and correctly - as if nothing had happened. ... This is an important step in our search for a cure for heart disease, the No. 1 killer in the developed world. We found that the heart of newborn mammals can fix itself; it just forgets how as it gets older. The challenge now is to find a way to remind the adult heart how to fix itself again. ... Previous research has demonstrated that the lower organisms, like some fish and amphibians, that can regrow fins and tails, can also regrow portions of their hearts after injury. ... In contrast, the hearts of adult mammals lack the ability to regrow lost or damaged tissue, and as a result, when the heart is injured, for example after a heart attack, it gets weaker, which eventually leads to heart failure. ... The researchers found that within three weeks of removing 15 percent of the newborn mouse heart, the heart was able to completely grow back the lost tissue, and as a result looked and functioned just like a normal heart. The researchers believe that uninjured beating heart cells, called cardiomyocytes, are a major source of the new cells. They stop beating long enough to divide and provide the heart with fresh cardiomyocytes." A little while back, I was invited to preview an independent project under development at the behest of Alex Zhavoronkov, one of the trustees of the UK-based Biogerontology Research Foundation, a group with strong ties to the Methuselah Foundation and SENS Foundation communities. That project is now launched and open to the world: it is the International Aging Research Portfolio - "tracking international progress in aging research". 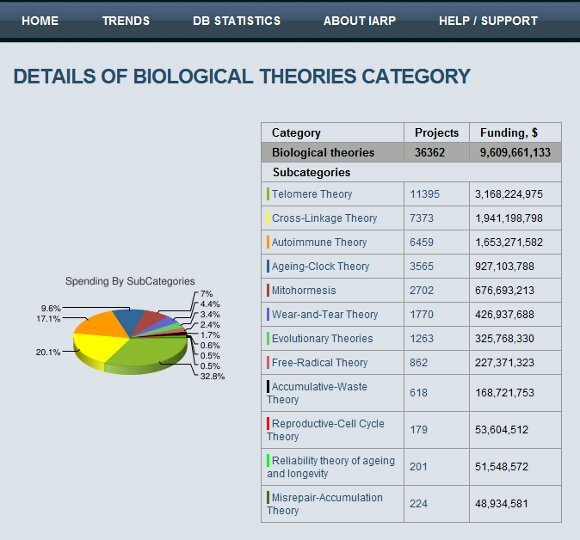 The site grants users access to research and funding information for over a million [projects]. The IARP is a fully searchable, flexible and highly scalable knowledge-management system developed to enable organizations to collaborate, track, analyze, structure, make decisions and set directions for future research efforts in aging. ... Aging research spans many areas of natural and social and behavioural sciences and requires a high degree of interdisciplinary and international cooperation. The goal of IARP is to provide a centralized decision support system for scientists, research institutes, funding organizations and policy makers involved in aging research. Color me surprised that funding of work on telomeres in aging is so very far ahead - but there's the purpose of data mining, to learn. The hope here is that data mining tools that operate on this large data set will provide compelling benefits for the research community, such as by making it easier to match up research proposals to funding sources based on the sort of awards made in the past. Public sources of funds are over-represented in this database by virtue of being public sources and thus producing records that are generally more accessible. One can imagine a slow extension of such a data aggregation operation into the private funding space based on the same provision of compelling benefits. If you make it worthwhile by streamlining the process of fundraising (on the research side) and the process of finding suitable projects to fund (on the funding source side), then people will use the system and in the process support its evolution and growth. We expect to see good correlations between many aspects of our biology and aging: "Epigenetic variations have been widely described to occur during the aging process. To verify if these modifications are correlated with the inter-individual phenotypic variability of elderly people, we searched for a correlation between global DNA methylation levels and frailty. We found that the global DNA methylation levels were correlated to the frailty status in middle/advanced-aged subjects but not with age. A 7-year follow-up study also revealed that a worsening in the frailty status was associated to a significant decrease in the global DNA methylation levels. These results suggest that the relaxation of the epigenetic control in aging is specifically associated with the functional decline rather than with the chronological age of individuals. Thus, the modifications of DNA methylation, representing a drawbridge between the genetic and the environmental factors affecting the age-related decay of the organism, may play an important role in determining physiological changes over old age." Equally, it may go the other way - these changes could just as well be the symptoms of damaged systems flailing as they try to adapt to countless small breakages at the level of cells and molecular machinery. It is important in the development of therapies for aging to try to identify the root causes, as fixing those will also solve secondary issues. Decellularization is proving to be a versatile technology in tissue engineering: grow the tissue from stem cells or accept a donor organ, strip its cells to leave behind the extracellular matrix, and then repopulate it from the recipient's stem cells to make it ready for transplant. For example: "Heart bypass patients may soon be able to get new arteries without having to sacrifice vessels from other parts of their body, thanks to ready-made, off-the-shelf artificial blood vessels. Biomedical engineers have been trying to build replacement blood vessels, needed for coronary artery bypass surgery and kidney dialysis patients, for three decades. Researchers from Humacyte Inc., in Durham, N.C., discovered the trick: recruiting cells to build the vessel, then washing them away so the nonliving tissue is storable and works for anyone. ... The company has managed to make a "universal blood vessel. This is very practical and convenient for clinical applications. ... Other approaches, customized with a patient's own cells, take several months to prepare. ... Though Humacyte is starting to plan human clinical trials, it's too early to predict when the grafts would become available to the general public. ... [researchers] not yet know how much the grafts would cost, but anticipates it will be less than the $15,000-and-up for personalized grafts from patient's own cells. The company can use cells from multiple cadavers to generate hundreds of grafts at once, making production much cheaper." I am not complacent about the cancers that no doubt lie in my future - just as they lie in yours. But I am not terribly concerned either; I give more thought to the fate of my wallet than to the fate of my flesh when it comes to cancer. By the time I hit the stage of life at which cancers are most likely to manifest, then the state of the art in safe and robustly effective cancer therapies will be impressive indeed. That will be true even if all that happens in between now and then is that the present technology demonstrations carried out in laboratories are developed into commercially available therapies ... and I'd expect far more progress than that to happen over a twenty year span of time. Here are two more reassuring examples of ongoing development in biotechnology for those of us fortunately enough to have the luxury of time when it comes to cancer - even if we certainly don't have the luxury of time when it comes to aging itself. Cerasomes [can] target cancer cells very specifically and accurately, rather than affecting a larger area that includes healthy cells. The problem with ceramide is that as a lipid, it cannot be delivered effectively as a drug. To solve this limitation, the researchers use nanotechnology, creating the tiny cerasome, to turn the insoluble lipid into a soluble treatment. Current cancer treatments destroy the cells that form the bulk of the tumour, but are largely ineffective against the root of the cancer, the cancer stem cells. This suggests that in order to provide a cure for cancer we must accurately detect and eliminate the cancer stem cells. researchers have [created a targeted] RNA aptamer, a chemical antibody that acts like a guided missile to seek out and bind only to cancer stem cells. The aptamer has the potential to deliver drugs directly to the stem cells (the root of cancer cells) and also to be used to develop a more effective cancer imaging system for early detection of the disease. Many different research groups are developing many different competing methods of both targeting cancer cells and delivering existing chemotherapy compounds in a highly targeted way. The chemical compounds used in many existing cancer therapies could be the basis for very safe and very effective future therapies if only they could be delivered just to cancer cells, and in small doses that did not leak out into neighboring tissues. This is exactly the capability being demonstrated over the past few years in laboratories around the world. Researchers demonstrate that exercise can counter some of the effects of an engineered acceleration of mitochondrial dysfunction: "researchers [found] that signs of premature aging were halted - and even reversed - in virtually every tissue and organ in the bodies of exercised mice. Mice genetically altered to age faster were forced to run on treadmills for 45 minutes, three times a week. Five months later, the mice looked as young, healthy and active as wild-type mice - mice that didn't have the genetic mutation - while their sedentary and same-aged siblings were balding, greying and shrinking. .. The mice were genetically manipulated to age twice as fast as normal because of a defect in the repair system of their mitochondria, the powerhouses or furnaces inside each cell that give our body energy. Evidence has been mounting for decades that the older we get, the more mutations we accumulate in mitochondrial DNA. The furnaces start to break down, resulting in a steady decline in tissue and organ function. ... In our study, we saw huge recovery in mitochondrial function [in] the exercised mice." We might expect this result, given that exercise is known to have an impact on longevity, as well as on many of the biological mechanisms that are associated with aging. Given the importance of mitochondria in aging, it is interesting to see more work on the links between exercise and their function - but we must always be careful when evaluating work based on engineered dysfunction or accelerated aging. It is often the case that the putative end result has little relevance to "normal" aging. An open access paper: "Nearly 50 years ago geneticist James Neel famously proposed that 'thrifty genes' were important contributors to the rising prevalence of diabetes. Such genes promote efficient use and conservation of food energy, he theorized, and thus were favored by natural selection to help our ancient ancestors cope with famines. Now widespread in various populations, they predispose to obesity and diabetes, abetting a tendency to prepare for famines that never come. ... Here I propose an extension of this reproduction-centered version of Neel's theory that bears on aging. One of my key premises is that many windows of opportunity for reproductive booms occurred during the Holocene as agricultural innovations spread, periodically increasing food availability between times of nutritional stress. The periods of plenty selected for genotypes capable of rapidly ramping up fecundity as food intake increased. ... I believe the boom times' selection of genotypes prone to nutrition-cued accelerated development is having an especially problematic effect today because of widespread childhood overnutrition. Accelerated development, which enhanced reproductive success in the past, now has a pro-aging effect with rapidly growing costs. Indeed, when viewed through the lens of the antagonistic pleiotropy theory of aging, this effect seems anything but thrifty: It predisposes toward what might be called the spendthrift phenotype, characterized by chronic activation of pro-growth pathways - notably those involving mTOR, insulin, and insulin-like growth factor-1 - that support rapid development and sexual maturation but that also underlie later senescence. The modern fallout encompasses a much broader array of age-associated ills than the diabetes that prompted Neel's original hypothesis. Indeed, the spendthrift phenotype may well increase the age-associated risks of most if not all diseases of aging, like the ruinous adult legacy of flush, fast-living youth." The Cryonics magazine published by Alcor is looking very professionally done these days. If you head on over there, you'll find a good-looking website and crisp PDF downloads: "Cryonics magazine is the quarterly electronic publication of the Alcor Life Extension Foundation. Cryonics magazine is also available as a paper magazine by ordering individual copies at MagCloud or by ordering subscriptions to the paper edition from Alcor. The magazine website also publishes exclusive content and news items that are relevant to the science and practice of cryonics. ...The 2010 4th quarter issue of Cryonics covers the challenging and sensitive topic of persuading family members to make cryonics arrangements. Editor Aschwin de Wolf contributes an article about writing cryonics case reports and how to overcome the challenges that a growing cryonics organization presents for writing them. We continue our coverage of Alcor staff members with a feature on Alcor Finance Director Bonnie Magee. ... The 2010 3rd quarter issue of Cryonics publishes the first comprehensive Alcor Human Cryopreservation Protocol. This document covers all steps of cryonics procedures, from standby to long term care at liquid nitrogen temperatures. Robert Freitas summarizes his econometric analysis of Alcor finances and Alcor staff member and life extension historian Mike Perry is featured in this issue's member profile." From CNN: "We started out by taking a typical desktop inkjet cartridge. Instead of ink we use cells, which are placed in the cartridge ... The device could be used to rebuild damaged or burned skin. The project is in pre-clinical phases and may take another five years of development before it is ready to be used on human burn victims. ... researchers say organs - not just skin - could be printed using similar techniques. ... The skin-printing process involves several steps. First, a small piece of skin is taken from the patient. The sample is about half the size of a postage stamp, and it is taken from the patient by using a chemical solution. Those cells are then separated and replicated on their own in a specialized environment that catalyzes this cell development. ... We expand the cells in large quantities. Once we make those new cells, the next step is to put the cells in the printer, on a cartridge, and print on the patient ...The printer is then placed over the wound at a distance so that it doesn't touch the burn victim. ... It's like a flat-bed scanner that moves back and forth and put cells on you. ... The device can fabricate healthy skin in anywhere from minutes to a few hours, depending on the size and type of burn. ... researchers said they're pleased with results of preliminary laboratory testing with the skin printer [and] already have been able to [make] healthy skin." There is a debate over whether aging is a disease, and here is some insight into where the aging of the brain and neurodegenerative diseases fit into that larger argument: the "question of whether 'aging itself' is or is not a 'disease' has long been mooted in biogerontological circles, with a long-held rhetorical preference for asserting that it is not, but rather, that it is a risk factor for the specific diseases of aging. By contrast, the same fundamental semantic dispute was initially resolved in the opposite direction with regard to age-related cognitive decline and dementia, beginning in the early decades after Alois Alzheimer and Emil Kraepelin first identified the pathological basis of the Alzheimer's disease (AD) until the early 1970s. For most of the twentieth century, it was held that dementia occurring in younger people should be classified as a disease, whereas dementia should be expected and accepted when it occurred in people at more advanced ages, despite the knowledge that the lesions linked to Alzheimer's dementia accumulated throughout the course of "normal" aging in middle age and onward, and that the pathological basis of the disorder was the same in both cases. ... But beginning in the 1960s, a loose alliance led by social gerontologists but quickly coming to include biogerontologists, geriatricians, and patient advocacy groups successfully campaigned for a new understanding: that while some level of minor cognitive decline was indeed a 'normal' and inevitable part of aging, the newly-rediscovered clinicopathological entity, 'Alzheimer's disease,' was exactly that: a disease, against which the full force of public and private biomedical research should be mobilized in the pursuit of a cure." These debates are almost entirely driven by the state of regulation in medical development; in particular that the FDA does not approve treatments that are not aimed at a defined and accepted disease - and aging is not a disease to the regulators, so no-one can try to treat it legally. This is an abysmally stupid situation, but sadly par for the course wherever government becomes involved. An interesting piece on the comparison of aging between species: "The 'shape' of aging describes how much mortality, the risk of dying, changes with age. One way of measuring the shape of aging is the 'aging factor' across species. For example, the common swift has an aging factor of 2, meaning mortality doubles during its adult life, compared with modern humans, who have an aging factor that exceeds 2000. ... Some organisms live a short time, others live a long time. This is the pace of ageing. Short-lived species have a fast pace of ageing, and long-lived species have a slow pace of ageing. Pace describes how quickly the clock of life ticks away. For humans it ticks slowly, for small songbirds like the robin it ticks very fast. At the age of 15, only 2 out of 100,000 girls in Sweden die, but one out of every two women aged 110 will die. This large difference in mortality at the beginning and end of adult life means that for humans the shape of ageing is steep, whereas in other species like the common swift it is shallow. And in some species the risk of death can even fall with age, with older individuals having the least risk of dying. This seems to be the case for the desert tortoise, and for alligators or crocodiles. ... Comparing robins with Swedish women, humans have a slow pace of ageing whereas the robin's is fast, so in terms of length of life the humans are doing best. But if we look at the impact ageing has on death rate the robin wins. Its shape of ageing is fairly flat whereas the humans' is steep, indicating that death rates increase markedly with age ... Not all species with short lives live fast and die young. Robins do, but mountain sheep do things differently. They also live pretty fast but die older. From the data I have, it seems that live fast die young is only one option; you can also live fast and die older, or live slower and die young, or live slow and die old. There might be every combination in nature. That's something we need to find out in the future with better data." Around these parts Aubrey de Grey and the SENS Foundation should require no introduction. His advocacy and the Foundation's work on the science of repairing aging is well known, and has been mentioned here at Fight Aging! too many times to count. In my eyes, the Strategies for Engineered Negligible Senescence (SENS) continue to be the best extant plan for extending human life span as rapidly as possible - and within our lifetimes. The more funding that is devoted to realizing that plan, the better all of our futures will be. Last time I had Dr. Aubrey de Grey on Singularity 1 on 1 the interview turned out to be a hit. In fact it is still by far the most popular podcast that I have done and the audio file has been listened to or downloaded over 30,000 times. Given Aubrey's popular appeal and the importance of his work, it is no surprise that I am very happy to have him back for a second interview. ... During this conversation I ask Dr. de Grey to discuss issues such as: the term natural death and its impact; the publicity and importance of two long-awaited documentaries about Ray Kurzweil - Transcendent Man and The Singularity is Near; traditional metabolic and more recent DNA tests such as the ones done by 23andMe and others; the slow developmental process of new drugs and therapies, and the problems of taking them from testing in lab rats to humans; the Thomas Malthus argument of overpopulation and Aubrey's reply to it. Head on over there to watch or listen. I welcome Dr. Paula Moreira as a new member of our editorial board, but for the worst possible reason. Moreira has been appointed as a replacement for Mark Smith, a fellow professor at Case Western Reserve University, who tragically died in a car accident late last year. What is even worse is that Smith is not the only loss that the field of biogerontology has suffered in 2010. In fact, I am aware of fully five other researchers who died during 2010. Amir Abramovich (whose Ph.D. advisor has penned a brief obituary that appears later in this issue) and Estela Medrano also succumbed to road accidents. James Joseph died from complications following heart surgery. Chris Heward was the victim of a particularly aggressive esophageal cancer. And Bob Butler died very suddenly of leukemia. I have chosen to highlight these sombre events in this space not only to commemorate lost friends and colleagues. My main reason for doing so is to draw attention to the questionable validity of our tendency to grieve especially intensely for those who die when still highly active. Though I share this tendency, I think it deserves scrutiny, because it is founded on an assumption that profoundly contradicts the motivation for the work to which we, as did the colleagues I have just listed, dedicate our lives. Aging kills people, just as cars do. There are only two things that distinguish aging from other killers: it kills people very slowly, only after gradually and progressively debilitating them over many years, and it only kills people who were born quite a long time ago. The combination of these features seems to be the only available explanation for why we so meekly and calmly accept the deaths of so vast a number of people from aging, while feeling much more intense anger and despair at the comparatively rare deaths that occur in the industrialized world at younger ages. Is it somehow OK, or at least only a little bit sad, when someone dies of "natural causes" after "a good innings"? I would suggest that it is not OK.
Ageism permeates our societies, and our descendants will look back in disgust and horror at the way in which we allowed our historical legacy of prejudice to suppress and slow down progress towards the biotechnologies of rejuvenation. We younger folk write off the old in so many ways, and in doing so each of us is only sticking the knife into the person we'll be a few decades down the line - and teaching our children to do exactly the same. Every death is a tragedy, but so many people work so hard to pretend otherwise. Old people suffer from a terrible debilitating medical condition: aging. Why view them any differently than the victims of any other deadly disease? If not weighed down by the degenerations of aging and the knowledge of suffering a certainly terminal condition, elderly folk could contribute greatly to all fields of human endeavor, applying the experience and knowledge of a lifetime - or adeptly applying the savings of a lifetime to fund the work of others. We would all be far wealthier if the ongoing ability to create value offered by human beings was not destroyed after a bare few decades of productivity. Even if it wasn't the case that it is in our immediate economic self-interest to build rejuvenation biotechnologies, working to cure aging would still be the greatest of charitable causes. No other aspect of human biology or the human condition causes as much pain and death. Aging is a horror, and it twists our society into further horrors - such as the often shameful ways in which the young treat the old. The sooner that aging can be repaired and removed as a threat to human existence, the better the human condition will become. Some evidence suggests that the worst effects of Alzheimer's disease can be repaired - that memories are not destroyed, but rather become inaccessible. Amyloid-beta and tau protein deposits in the brain are characteristic features of Alzheimer disease. The effect on the hippocampus, the area of the brain that plays a central role in learning and memory, is particularly severe. However, it appears that the toxic effect of tau protein is largely eliminated when the corresponding tau gene is switched off. Researchers from the Max Planck Research Unit for Structural Molecular Biology at DESY in Hamburg have succeeded in demonstrating that once the gene is deactivated, mice with a human tau gene, which previously presented symptoms of dementia, regain their ability to learn and remember, and that the synapses of the mice also reappear in part. The scientists are now testing active substances to prevent the formation of tau deposits in mice. This may help to reverse memory loss in the early stages of Alzheimer disease - in part, at least. The [study from 2008] documents a dramatic and unprecedented therapeutic effect in an Alzheimer's patient: improvement within minutes following delivery of perispinal etanercept, which is etanercept given by injection in the spine. Putting aside a discussion of the mechanisms by which this happens, the very fact that it can happen demonstrates the possibility of reversing the worst aspects of Alzheimer's. Thus memories and the working structures of the brain must remain largely intact until fairly late in the progression of the disease. From the Telegraph: "India's first set of government-approved clinical trials of stem cells on patients with chronic obstructive lung disease, diabetes, liver cirrhosis and osteoarthritis are likely to begin in five cities in April this year. A Bangalore-based company, Stempeutics Research, has received approval from the country's drug regulatory agency to evaluate the efficacy of its stem cells on these four incurable diseases after safety assessments over the past year on patients with cardiovascular disease. The efficacy - Phase II - trials are likely to begin on small groups of volunteer patients offered the experimental treatment in collaborating hospitals in Bangalore, Kochi, Delhi, Mangalore and Manipal, a senior Stempeutics official said. Each volunteer patient will receive a dose of mesenchymal stem cells derived from the bone marrow of healthy persons. The stem cells, coaxed to proliferate in a broth of laboratory biochemicals, will be injected at the site of illness - the pancreas, the liver, the lungs, or the bone - where they are expected to stimulate resident stem cells and regenerate the damaged or lost tissue. While private and even government hospitals have in the past offered stem cell therapy to patients with intractable conditions, the proposal by Stempeutics is the first with formal approval from regulators for chronic obstructive pulmonary disease (COPD), diabetes, liver cirrhosis and osteoarthritis." The Science for Life Extension Foundation is a Russian organization consisting of advocates and aging researchers. They are similar to the SENS Foundation in that they undertake a mix of fundraising, directing research, organizing events, advocacy for longevity science, and publishing on potential methodologies to extend the healthy human life span. These two groups even share some members and advisors in common - it's a small world these days, after all, and aging research is not a large community to begin with. That is one of many things we like to see change over the next decade or two: if you want rapid progress, there need to be many researchers at work. In experiments, livers in genetically modified mice 22 to 26 months old, the equivalent of octogenarians in human years, cleaned blood as efficiently as those in animals a quarter their age. By contrast, the livers of normal mice in a control group began to fail. ... While her paper does not show increased survival rates among the mice, le Couteur, who has advised her recently on the research, says Cuervo does have data on improved survival rates which she intends to publish. The silliest of all arguments raised against engineered human longevity have always been those involving forms of stasis - the unlikely specters of boredom and stagnation, for example. But to be alive is to be a force for change. No-one is static, not even those folk who try to be or who think they are. It recently occurred to me that one could build a fairly strong counterpoint to the "immortal dictator" form of stasis argument by pointing to the politics of past centuries in times when life expectancies were much shorter. The spans of governments and leaders back then were not all that different to what we see today - but today the life expectancies of people at every age are notably longer. So why don't we suffer empires to put the span of Rome to shame, and nations in which the commonplace span of social and political power is far longer than just a few years? The answer of course being that life is change. Carpe diem! So it was in the spirit of change and improvement that I turned off the Longevity Meme website this past weekend: switched the DNS to point to Fight Aging!, cancelled the hosting service, and then sent out the first weekly newsletter to go out under the Fight Aging! banner rather than that of the Longevity Meme. This has been in the works for a while, but here we are now with the deed done. The Longevity Meme had a ten year run as a project, first assembled in a crude format back in 2001 - when I'd had enough of just thinking about longevity science and wanted to actually do something about it. As a non-biologist, writing and advocacy seemed like a sensible path forward. Evidently I'm not cut from the same fabric as folk like Aubrey de Grey and Kevin Perrott, once non-biologists, whose response to the same urge was to take a hard right turn in life and become biologists working in the field of aging research. The scale of the challenge is such that we need as many such motived people as we can get. Ten years of managing the Longevity Meme spanned my observer's education in the biology of aging and longevity science, as well as the rise of the present younger generation of advocacy groups such as the Methuselah Foundation, SENS Foundation, Immortality Institute, and many others. I can't claim anything in this beyond it being the zeitgeist of the last decade: it was in the air. In ten years we've moved from a fringe environment - in which the main course of action was persuading people to take seriously the prospects for longevity science - to a more mainstream environment in which raising support and large sums of money for work on rejuvenation biotechnology is the primary, plausible goal. The Longevity Meme was more a project for the old environment, and Fight Aging! is more a project for the new. I am beginning to think the the waters of education and public awareness have risen far enough for the act of raising money for longevity research to be a work of advocacy in and of itself. The process of raising funds - of networking, education, and persuasion - conveys a message in and of itself: that this ideal of defeating aging is real and here and moving. It isn't an abstract future, a vague something, but rather tangible progress that is taking place in laboratories right here and now. So I will be thinking more on the topic of how to steer money towards the best research facilities and goals in the years ahead. For now, Fight Aging! is as you see it: a source of news and opinions on the topic of engineered human longevity. One of those opinions is, as always, that you should head on over to either the Methuselah Foundation or the SENS Foundation and make a donation to support their work. Or persuade a friend to do the same: that is where the future starts, by voting with your wallet. There's always something interesting in the news when it comes to progress in regenerative medicine and tissue engineering. This is the sort of research community we want to see for every field that might impact human aging and longevity: large, thriving, dynamic, and attracting plenty of attention and funding. The practical result is that we live in exciting times - organ regrowth is right around the corner, as is the prospect of meaningful repair or replacement of many types of aged tissue. Regenerative medicine is not a one-stop solution for all of aging, but it is one of the necessary pillars of the true rejuvenation biotechnology that will be developed in the decades to come. Here are a few articles that caught my eye of late; the mainstream media seems to be picking up the level of attention they are giving to the cutting edge of regenerative medicine these days. In one lab, a surgeon builds a pink, pulsing heart, cell by cell. In another, a researcher literally sprays new skin onto severely burned patients. Elsewhere, a scientist re-creates the delicate folds of the ear - on the back of a mouse. Sound like science fiction? It already is science: Researchers in Boston and beyond are building everything from blood vessels to internal organs, using engineering tricks and dome-like bioreactors. Tonight, in 'How to Build a Beating Heart,' National Geographic Explorer investigates those efforts to transform human health, revealing the pulse-quickeningly cool side of regenerative medicine. If an injured salamander can grow a new limb, why can't a human? Maybe they can, say researchers at the Armed Forces Institute of Regenerative Medicine. Starting with stem cells from patient's bodies, scientists at this Wake Forest University facility have grown 22 different types of tissues and organs. Lives are being saved and more amazing successes are on the way. Using skin cells from young patients who have a severe genetic heart defect, Stanford University School of Medicine scientists have generated beating heart cells that carry the same genetic mutation. The newly created human heart cells - cardiomyocytes - allowed the researchers for the first time to examine and characterize the disorder at the cellular level. ... the investigators also report their identification of a promising drug to reverse the heart malfunction - for which there are currently no decent treatments - after using these newly created heart cells to check the effects of a plethora of compounds. The first animal stem cell procedure in Oregon done entirely in a veterinary facility is scheduled for Thursday at the Oregon State University College of Veterinary Medicine. The procedure will be performed on Basco (pronounced "Bosco"), a 7-year-old German Shepherd suffering from osteoarthritis in his left rear hip. ... Fat tissue is removed from the animal, the stem cells are separated and activated, and then injected into the affected area. Within three to four weeks of the procedure, Basco should be moving well, with little or no pain, Medi-Vet predicted. Veterinary medicine is far ahead in its application of first generation stem cell therapies; if you're a human in need of the same sort of treatment, you'll have to leave the US to find it. The principle effect of heavy US regulations on medical development is to ensure that working, beneficial, reasonably safe treatments take a very long time to come to the clinic and are very expensive when they arrive. Fortunately the FDA can't do anything about the competitive service providers and medical research and development groups in other parts of the world. Thus, absent a sea change in the state of regulation in the US, medical tourism will be a part of all our futures, and we will benefit greatly from the fact that at least some parts of the world are not as shackled and held back by a full-on command economy medical system. Research and development always takes longer than expected, but at this point I look at research into sirtuins as an early step forward on a much longer road - a part of the foundations of some later work, and producing little of direct use in and of itself. The newer technologies and newer companies who work on the same strategy of slowing aging via identification of ways to manipulate metabolism will leap over the work of the last five years, producing a hundred-fold more genetic and biochemical data in the process. Biotechnology is advancing so rapidly that each generation of development is made obsolete before it even hits its stride. It will be interesting indeed to see what comes after the present generation of biotech startups like Genescient and Halcyon Molecular. But back to sirtuins: here is an optimistic open access paper from researchers who do see a bright future for the development of sirtuin-based therapies. How does aging occur? Can we delay the aging process? These are questions that have been asked for hundreds if not thousands of years. Aging is one of the most fundamental biological processes. It results in a decline in physiological function and an increased risk for pernicious diseases such as cancer. Oxidative stress has been proposed as a major cause of aging, but experimental tests of this hypothesis have been discouraging. Calorie restriction (CR) prevents age-related decline, but there are still gaps in our knowledge of the exact mechanisms underlying this feat. Finally, a tenuous balance exists between aging and cancer, calling for a search for interventions that prevent both aging and cancer. Recent work on the mammalian sirtuin SIRT3 has shed light on these long-standing issues and suggested new approaches to ameliorate the ravages of aging. This research group proposes that Sirt3 acts on longevity through increasing antioxidants - we should all be appropriately skeptical, given the very mixed evidence for links between cellular antioxidants and longevity. That said, Sirt3 is located in the mitochondria, and the demonstrations of extended life spans through increased antioxidants have involved targeting those antioxidants to the mitochondria. When considered in the broader context, a great many lines of research turn to point towards our mitochondria and the damage they suffer over time. All the more reason to direct greater efforts towards nascent mitochondrial repair technologies rather than yet more metabolic tinkering. The optimists understand the promise of rejuvenation biotechnology - that we stand on the verge of being able to greatly extend the healthy human life span - while remaining aware of the challenges that lie ahead. It will require decades to get to where we're going, but the goal of human agelessness can be attained if we put our shoulders to the wheel. A pessimist is dismissive of technological progress, either deliberately or through simply being one of those people who don't spend a lot of time in the consideration of change. Their thoughts on aging are locked to the here and now, caught in the moment. While rigorous in their examination of what is, their projections of what will be are unreliable - their view of aging tomorrow is that it looks much the same as aging today. The optimistic fool believes some or all of the nonsense propagated by the "anti-aging" marketplace, or has deluded himself into thinking that a silver bullet lies just around the corner, some combination of lifestyle and ingested substance if it could just be found. In reality he is only spinning his wheels, just like all who came before him. If old age isn't for sissies, then neither is Susan Jacoby's tough-minded, painful-to-read and important book, "Never Say Die," which demolishes popular myths that we can "cure" the "disease" of aging and knocks the "g" right out of the golden years. Forget about those dreams of dropping dead on the tennis court or in a lover's arms at age 95. Such happy endings could happen to us, but the odds are great that they won't, in spite of how frisky we currently feel and in spite of our dedication to a vegetable-eating, nonsmoking, moderate-drinking, daily-exercising lifestyle. The book covers the ugly realities of degenerative aging in the here and now, but also, as you can see from the quote above, has little good to say about the present and future of medical science. This is a pity, as I think there is great value in puncturing the rosy, populist views of aging put out by the self-empowerment industry, as well as the bubbles most people build around themselves in their efforts not to think about the future of their own aging. Everyone should be afraid of what aging brings - fear is a perfectly rational response to the slow and painful failure of body and mind that lies ahead. If people were less successful at burying this very sensible fear, perhaps they would be more motivated to help advance the cause of longevity science. People who concern themselves with looking deeply at the here and now often produce works like "Never Say Die" - but a correct analysis of the present only accomplishes half the job of education. It has to be followed up with a correct analysis of change, progress, and the ways in which we can solve the identified problems. Here, that means the engineering of medical technologies to repair the biological damage of aging, something that will happen far more rapidly, I think, if more people looked at the world we live in now with wide open eyes and no illusions. Even the most widely recognized greatest disasters in human history pale in comparison to natural death. For example, the typhoon that struck Bangladesh in 1970 washed away a million lives. In 1232 AD, Genghis Khan burned the Persian city of Herat to the ground. It took his Mongol horde an entire week to slaughter the 1.6 million inhabitants. The Plague took 15 million per year, World War II, 9 million per year, for half a decade each. The worldwide influenza pandemic of 1918 exterminated less than 22 million people - not even half the annual casualties from natural death. But natural death took 52 million lives last year. We can only conclude that natural death is measurably the greatest catastrophe humankind has ever faced. The age of parochial monolinguism is both coming to an end and stretching out into the foreseeable future. The developing technologies of automated translation will soon enough enable nearly all of us to have our cake and eat it too: to be both fluent in only one language yet speak and understand all languages. In the world of online communities the development of seamless translation tools is already lowering barriers, even though this is a field yet in its infancy. Witness the connections between Russian and English language longevity science advocates, for example, and the ability for any of we Westerners to wander into the network of Russian language blogs and read them in English. An era without aging, disease, and even without shyness or anxiety; an era that would increase the capacity of brain information processing, hopelessly human, too human. This is the future predicted by transhumanism, a movement rooted in the belief of a positive evolution of humanity [under] the influence of technology. Billed as a "disease", death must disappear from the human field and life expectancy tend to infinity. The objective is fundamental, it is located in the top three "to do" transhumanist, says Remy Sussan, journalist [and InternetActu.net author of] a book about Utopias posthuman. Some go even further, seeking not only to bring down the wall of our ultimate condition of finite being, but also to reverse the effects [to develop methods of rejuvenation]. The contents in detail are less important than the existence of such articles, I think. A significant proportion of the world's population does not speak English, or has no great interaction with the English-language body of work on longevity science. To spread more broadly and gain more support, the ideals of engineered human longevity must become common topics of conversation in languages other than English. Technology will greatly accelerate this process, but it is encouraging to see the signs that it is happening anyway. "It is my contention here," Ball writes, "that all of the current debates about human embryo research, stem cells, cloning, genetic modification, and bioethics and biotechnology generally, regardless of whether they have any direct link to the creation of artificial humans, cannot be interpreted without understanding the cultural history of that idea and its relation to themes of 'naturalness'. Only by examining the old myths, legends and stories and the ways that they have been modified and mutated by the ages can we grasp the fears and preconceptions that teem beneath the surface of these discussions." Do people mistrust what their legends and tall tales tell them to be wary of, or does myth, ancient and modern, merely reflect a deeper set of human viewpoints? I suspect a little of both. The article quoted above looks primarily at the biotechnology of building humans, but our grand cultural heritage of stories is also of great importance when it comes to longevity science. We are headed towards the development of ways to defeat aging - and eliminate the consequent frailty and death by age-related disease - and yet so many people and so many myths welcome and romanticize aging and death. You may or may not be familiar with the Monomyth, but it should nonetheless be obvious that tales which reflect widely shared aspects of the human condition have a great and enduring power. Coming of age, attaining independence, romantic entanglements, challenge and adversity, victory over the odds - and an end to the tale in aging and death. We might say that every story is the story of the Fall: the golden past, the imperfect present, the uncertainty ahead. This is a mirror held to human lives as our millennia-long culture knows them: an age of health and triumph followed by a slow, knowing decline into the darkness we know nothing of. Aging and death are potent ingredients for authors, playwrights, and theologians, and were no less potent for the elders and shamans who came before them. The tales that audience members like will prosper, and this has always been the case, all the way back to fur-clad audiences of a few dozen, cave-dwellings, and burning branches to ward off the cold. Stories evolve, their characters and plot points like genes, and the relentless evolution of stories under the selection pressure of audience approval has given us a vast body of legends whose plots appeal viscerally to nearly every human. In turn, bodies of myth also serve as a form of education, still widely used by tutors, parents, and elders to teach their children - directly or indirectly - what it means to be human in their society. What do people do to survive and prosper? How does life progress? What are the rightful ways to act towards one another? And so forth. Over the past few years, researchers have designed and carried out interesting and ingenious experiments that try to narrow down which of the biological effects of calorie restriction are important when it comes to the resulting benefits to health and longevity. That calorie restriction notably lengthens healthy life span in almost all species tested to date is beyond doubt: eat less while still obtaining the necessary nutrients for survival and live longer as a consequence. The challenge for the scientific community is that the practice of calorie restriction changes an enormous range of metabolic processes and measures: levels of visceral fat tissue, expression patterns of genes known to be involved in aging, cell cycle behavior, body temperature, and so on down a long, long list. All of these factors are interdependent, and very hard to change in isolation of one another. Calorie restriction (CR) reduces the rate of cell proliferation in mitotic tissues. It has been suggested that this reduction in cell proliferation may mediate CR-induced increases in longevity. The mechanisms that lead to CR-induced reductions in cell proliferation rates, however, remain unclear. To evaluate the CR-induced physiological adaptations that may mediate reductions in cell proliferation rates we altered housing temperature and access to voluntary running wheels to determine the effects of food intake, energy expenditure, percent body fat and body weight on proliferation rates ... We found that ~20% CR led to a reduction in cell proliferation rates in all cell types. However, lower cell proliferation rates were not observed with (a) reductions in food intake and energy expenditure in female mice housed at 27°C, (b) reductions in percent body fat in female mice provided running wheels, or (c) reductions in body weight in male mice provided running wheels, compared to ad libitum-fed controls. In contrast, reductions in insulin-like growth factor-1 were associated with decreased cell proliferation rates. Taken together, these data suggest that CR-induced reductions in food intake, energy expenditure, percent body fat and body weight do not account for the reductions in global cell proliferation rates observed in CR. In addition, these data are consistent with the hypothesis that reduced cell proliferation rates could be useful as a biomarker of interventions that increase longevity. 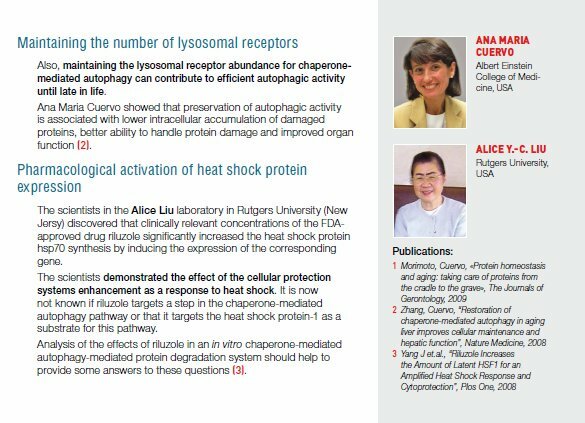 It is interesting that the hot environment CR mice have this distinctive difference in cellular behavior from those raised in a normal environment. The results that point at cell proliferation rates as something peculiar to the core processes of CR rather than any of its secondary effects, such as weight loss, are also interesting. It would be perhaps enlightening to revisit the twenty or more methods known to extend mouse life span and see what they are all doing to cell proliferation rates. If it turns out that a simple measurement could be used to quickly quantify the prospects of any potential new therapy to slow down the aging process, that would be a big deal. Another item worth noting is the investigation of drugs that can slow cell proliferation - the cancer research community has developed a few of these, but it is a long way from here to something that could be made safe to give to healthy people. 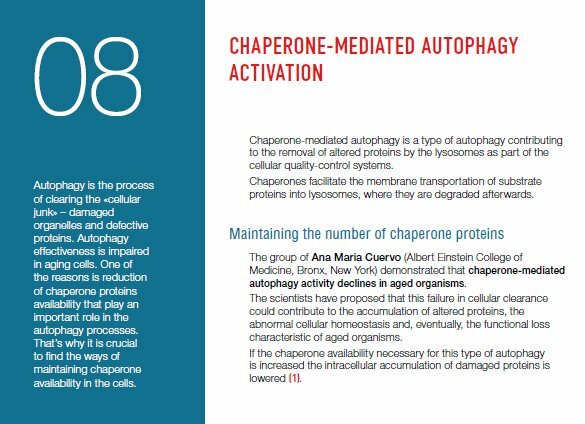 All such efforts are made challenging by the enormous complexity of metabolism: changing it safely is very hard, and changing any one aspect of metabolism in isolation is next to impossible. Australian clinical researchers have noted an extraordinary and unexpected benefit of osteoporosis treatment - that people taking bisphosphonates are not only surviving well, better than people without osteoporosis, they appear to be gaining an extra five years of life. ... Out of a total cohort of around 2,000, a sub-group of 121 people were treated with bisphosphonates for an average of 3 years. When compared with other sub-groups taking other forms of treatment, such as Vitamin D (with or without calcium) or hormone therapy, the longer life associated with bisphosphonate treatment was marked and clear. While the results seemed surprisingly good, they are borne out by the data - within the limitations of any study - and appear to apply to men as well as women. When we first looked at the figures, we thought that there had to be a fallacy, that we were missing something. One of the most obvious things might be that these are people who seek medical attention, so may be healthier and live longer. So we compared the bisphosphonate group with people taking Vitamin D and calcium or women on hormone therapy. The comparison against these other groups of similarly health-aware people simply confirmed that our results were not skewed by that factor. In a group of women with osteoporotic fractures over the age of 75, you would expect 50% to die over a period of five years. Among women in that age group who took bisphosphonates, the death rate dropped to 10%. Similarly, in a group of younger women, where you would expect 20-25% to die over 5 years, there were no deaths. The mechanism by which this extension of healthy life occurs is unknown. The authors of the study offer a guess relating to heavy metal deposition in bone tissue - but it is only a guess and frankly doesn't seem all that plausible, given all of the other potential candidate systems that might be influenced by bisphosphonate therapy. Whatever the mechanism, I can see this discovery being a tremendous encouragement for the industries of people who believe that great good can be achieved for human longevity through the old style development of injections, pills, and other forms of traditional medicine. I think they're all wrong, and that the future of longevity lies in other directions - but this sort of discovery does tend to undermine that position. It's all a utilitarian and economic argument: if someone today discovers a cheap way to boost life expectancy by five years for most of the population, then obviously that is worth developing out into a product. But is it worth spending billions hunting for the possibility of a nebulous old-style medical therapy that can boost life expectancy by five years versus spending that same amount on the development of rejuvenation biotechnology? No, of course not. Given the present systems of regulation in place in much of the world, it seems unlikely that anyone in the mainstream research community will run the obvious follow-up study on healthy older folk - despite, I'm sure, there being no shortage of volunteers should such a study take place. There is a considerable institutional and regulatory bias against the investigation and development of any form of therapy not targeted against designated diseases, and aging is not a designated disease. If you grew up reading science fiction from the golden era of pulp and wide-eyed planetary optimism, then you've no doubt noticed that you are more or less already living in the shining future those authors wrote about. We ended up with computing power and biotechnology far beyond their imagining rather than near-free energy and space travel, but the results are just as impressive. On the whole we're better off with the direction taken by reality over fiction: massive low cost energy generation and distribution technologies wouldn't do anything to slow down the aging process. In an article published in the January issue of the journal Nanomedicine, the researchers suggested the use of an outside-the-body filtration device to remove a large portion of the free-floating cancer cells that often create secondary tumours. The scientists have formed a startup company and are working with a medical device firm to design a prototype treatment system that would use magnetic nanoparticles engineered to capture cancer cells. Added to fluids removed from a patient's abdomen, the magnetic nanoparticles would latch onto the free-floating cancer cells, allowing both the nanoparticles and cancer cells to be removed by magnetic filters before the fluids are returned to the patient's body. Rice University bioengineers and physician-scientists at Baylor College of Medicine and Texas Children's Hospital have successfully destroyed tumors of human brain cancer cells in the first animal tests of a minimally invasive treatment that zaps glioma tumors with heat. The tests involved nanoshells, light-activated nanoparticles that are designed to destroy tumors with heat and avoid the unwanted side effects of drug and radiation therapies. Gold nanoshells, which were invented by Rice researcher Naomi Halas in the mid-1990s, are smaller than red blood cells. Nanoshells are like tiny malted milk balls that are coated with gold rather than chocolate. Their core is nonconducting, and by varying the size of the core and thickness of the shell, researchers can tune them to respond to different wavelengths of light. Houston-based biomedical firm Nanospectra Biosciences, which holds the license for medical use of Rice's nanoshell technology, began the first human clinical trial of nanoshell phototherapy in 2008. We no longer live in the world our parents grew up in, for all that it's easy to forget just how far medical science has progressed in our lifetimes. This progress is speeding up; the new and better is arriving ever faster. Somewhere out there in the future is a cancer with your name on it, and as we live ever longer thanks to other advances in medicine, it will become very important that the next generation of cancer therapies be made highly reliable and very safe.